Awaken to the vastness of you! 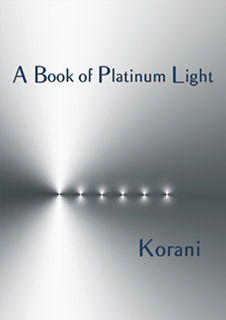 "A Book of Platinum Light" is a short but powerful e-book containing seven Platinum "Portals", each of which serves as a gateway, opening and expanding you into greater awareness so that you might access more of the Divine being you truly are. It is a "small" book with a "big" energy! Each Portal carries a particular vibration that facilitates you in awakening to the vastness of you. The more you allow yourself to receive these vibrations the more you will be able to access within yourself the energies they transmit. The seven Platinum Portals are inspired by and closely linked to the seven Platinum Gaia oils from the Colour Mirrors system. They're part of what I call the "New Earth" energies - guides and lights to show us the way to a new reality on this planet. This e-book is small yet potent. Each of the seven Portals is a 'download' of light - platinum light - and offers a specific transmission, carried in the words of the book, guiding you into the vastness of the light you truly are. N.B. As soon as your order has been processed you will receive a confirmation with the link to download "A Book of Platinum Light" e-book.